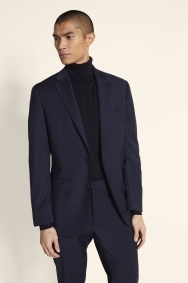 Be ready to take on whatever the day throws at you in this sharp suit. 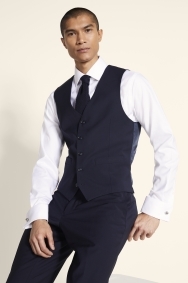 This 3-piece suit is a winner with its defining tailored fit and classic navy colour. 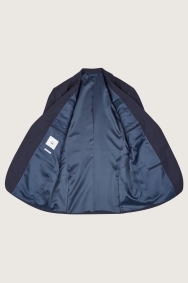 It’s also made to look smart all day thanks to the anti-crease and water-repellent Performance material, giving you confidence that your outfit won’t let you down. 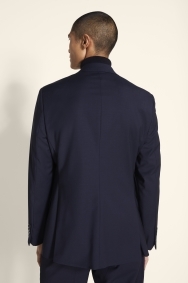 The jacket itself has a simple notch lapel and straight pockets to suit every occasion. 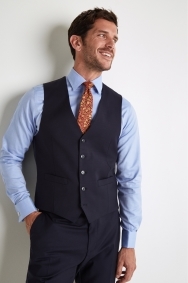 Match the muted navy with more blues in your shirt and tie for an elegant outfit, and reach for a pocket square in a rich hue to warm up the look. Very comfortable. All sizes available to suit. Don't know, I am still waiting. 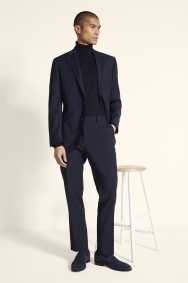 Suit, exactly what I wanted at a decent price. The service was outstanding. We were not rushed and we appreciated the time spent with us. A range of options were offered. We would definitely recommend the staff at the Winchester branch of Moss Bros. We are very pleased with the suit. Very good material and tailored to fit my size. Very pleased with the suit quality and fit. Good to have an alternative to Next and Debanhams......and to realise not everyone wants a super skinny fit suit !